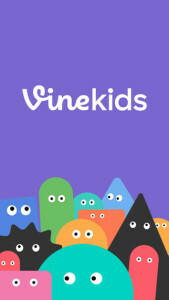 Vine Introduces App for Kids: Vine just launched Vine Kids, an app designed so young kids can enjoy Vines. The app only plays Vines that are appropriate for a young viewing audience and includes sound and animated effects designed to appeal to kids. The app is available for iOS devices as of this writing. Facebook Adds Place Tips to Mobile App News Feed: Facebook mobile app users, may have noticed place tips in their newsfeed this week. When tapped, the tips open a series of cards with information about the place a user is at and photos and posts their friends may have shared about that place. If available, times like that place’s Facebook Page, menu, and/or upcoming events may appear. Tumblr Makes Major Updates to Platform: Tumblr took two days to release its biggest update yet. Changes include the ability to add images and video anywhere in a caption, and dynamic-looking text. Posts will also appear as they should after hitting “publish” while drafting. Tumblr has also added text formatting options like subheads and horizontal lines. Snapchat Launches Discover: Snapchat rolled out Discover, a new content platform that hosts Stories from select media groups. The content is refreshed every 24 hours and users can scroll through content by swiping left or right and then slide up for the full video or article. 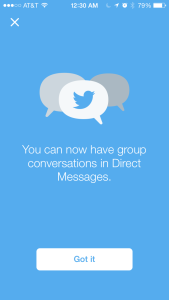 Twitter Introduces Group Direct Messages and Mobile Video: Twitter has expanded their direct messaging (DMs) feature to allow users to create group DMs for a group of up to 20 people. Twitter has also expanded their picture-taking function to allow users to capture videos to embed directly into tweets. Videos, which can only last up to 30 seconds, can be taken to add to tweets in much the same way photos were taken. Pinterest Updates Promoted Pins: Pinterest is now allowing users to hide promoted pins they don’t like and provide feedback as to why they weren’t liked. The move is intended to keep relevant suggested content in users’ feeds and help marketers using promoting pins to connect with the right audience. Twitter Adds Bing-Powered Tweet Translator: Twitter added a Bing-powered translator for users who want to read tweets written in languages other than their own. To translate a tweet, users should look for and click on a globe icon within the tweet. Once clicked, a translation will appear below the original tweet.